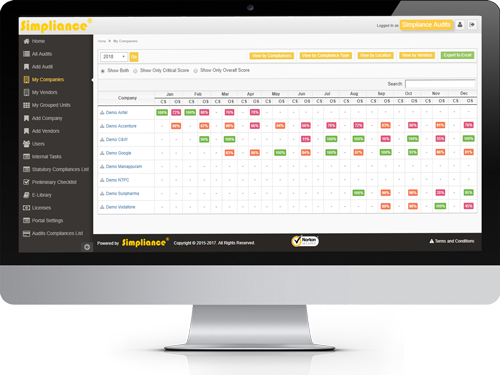 Simpliance Bespoke Audit Management platform is flexible to suit all your organization’s audit requirements. The tool can be tailored and customized as per multiple audit engagements and is simple and effective in implementation. 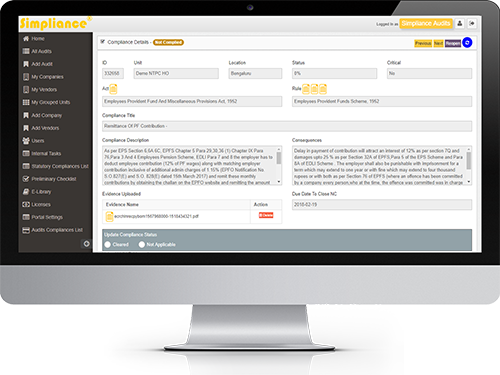 Simpliance helps business reduce costs and enhances overall productivity for both the organization as well as the auditor. 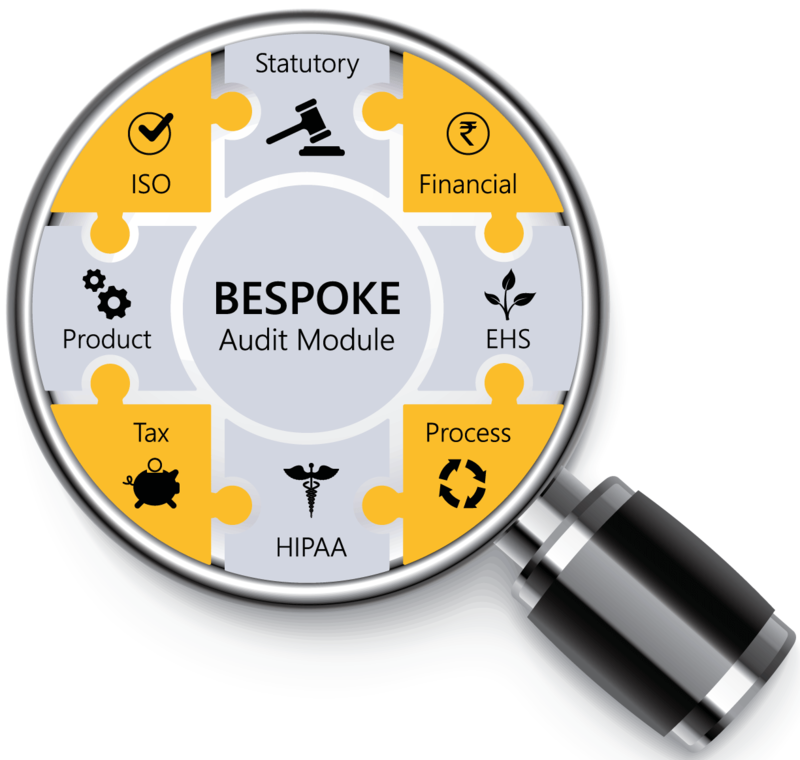 Ranging from financial audits (as per the international accounting standards), assets audit to ISO audits, the Internal Audit Management application scope manages the auditing end-to-end. Detailed auditing report with simplified work paper management and risk-based auditing processes help business meet their specific audit requirements in a most efficient method. 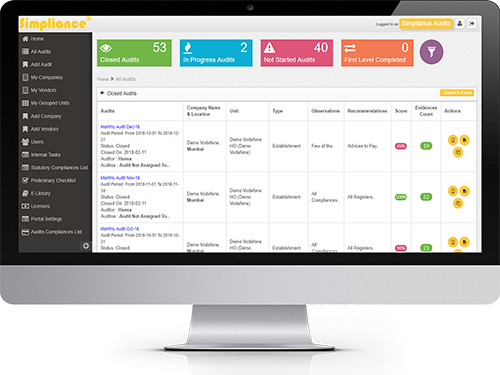 The framework allows businesses to tailor the software to suit any specific audit requirement ranging from any type of internal audit to external audit. 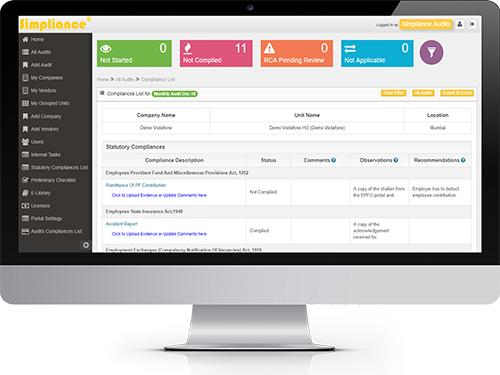 Simpliance's intelligent engine enables faster and accurate audits by allowing Auditors to configure the applicable checkpoints for any auditing segment. Simpliance creates ready audit reports with options to export to PDF or Excel automatically once the audit has been completed. Detailed Non-Compliance (NC) reports give quick insights into the NC to enable faster resolution. Global audit standards and principles of CAPA (Corrective Action Preventive Action) ensure mitigation of risks recognized and highlighted during the audit process. Advanced options enables sighting of Non Compliance (NC) by auditors and allows tracking and updation by auditee until closure of NC. Different roles and permissions for audit users within the organization, as well as external auditors and consultants. 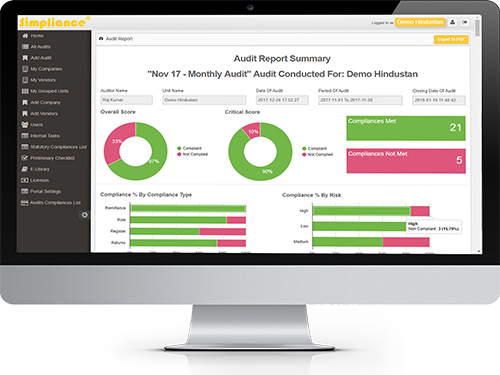 Simpliance’s audit platform with its flexible & easy to use interface allows organizations to create their own auditing checkpoints, weightage, risk and arrive at the scoring on an intuitive & beautiful dashboard. Organizations can identify and create pre-audit checkpoints which do not carry weightage, define process specific compliance checkpoints and create dynamic forms & fields to include other parameters of the audit. This flexibility allows organizations to conduct all kinds of audits such as and ISO audit, check of financial assets, Environmental Health & Safety, Social audits or even simple internal company audits belonging to internal processes. The easy to use cloud based platform allows online submission of evidences by auditees and online auditing by auditors ensuring the tracking, log, observation and recommendation are all visible to various stakeholders in the organization without the need for manual requesting & reporting.